It’s easier to maintain and less error-prone than setting a flag programmatically. It results in smoother UI transitions, because the system has the information it needs to render your UI before instantiating your app’s main activity. You can use FLAG_LAYOUT_IN_SCREEN to set your activity layout to use the same screen area that’s available when you’ve enabled FLAG_FULLSCREEN. This prevents your content from resizing when the status bar hides and shows. Where you set the UI flags makes a difference. If you hide the system bars in your activity’s onCreate() method and the user presses Home, the system bars will reappear. When the user reopens the activity, onCreate() won’t get called, so the system bars will remain visible. If you want system UI changes to persist as the user navigates in and out of your activity, set UI flags in onResume() or onWindowFocusChanged(). 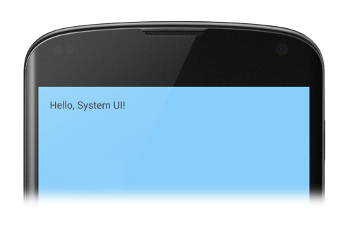 On Android 4.1 and higher, you can set your application’s content to appear behind the status bar, so that the content doesn’t resize as the status bar hides and shows. To do this, use SYSTEM_UI_FLAG_LAYOUT_FULLSCREEN. 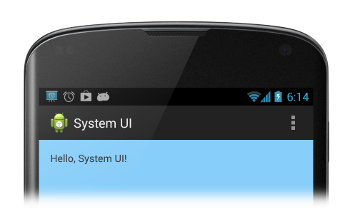 You may also need to use SYSTEM_UI_FLAG_LAYOUT_STABLE to help your app maintain a stable layout. When you use this approach, it becomes your responsibility to ensure that critical parts of your app’s UI (for example, the built-in controls in a Maps application) don’t end up getting covered by system bars. This could make your app unusable. In most cases you can handle this by adding theandroid:fitsSystemWindows attribute to your XML layout file, set to true. This adjusts the padding of the parent ViewGroup to leave space for the system windows. This is sufficient for most applications. In some cases, however, you may need to modify the default padding to get the desired layout for your app. To directly manipulate how your content lays out relative to the system bars (which occupy a space known as the window’s “content insets”), override fitSystemWindows(Rect insets). ThefitSystemWindows() method is called by the view hierarchy when the content insets for a window have changed, to allow the window to adjust its content accordingly. By overriding this method you can handle the insets (and hence your app’s layout) however you want.